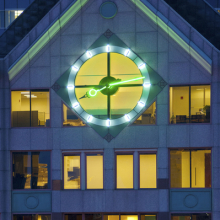 Americlock was commissioned to replace old non operating Neon lights with Rope LED lights on this 21 story high-rise office building in downtown Boston. With views of the financial district, the Charles river, and Cambridge, these tower clocks can be seen for miles away. 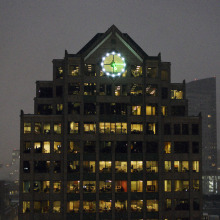 The building had one clock on the west side of the building and one on the east side of the build. These clocks would become LED illuminated clocks. Because the original clock number lights and clock hand lights were two different colors, we were able to match these colors exactly with the new Green Rope LED lights and White Rope LED lights. Replacing the old neon lights also helps save this customer money with energy efficient LED lighting. These Rope LED lights are 24V low voltage lights. In addition to replacing the clock lights, Americlock also fabricated new lightweight clock hands to replace the existing heavy clock hands. The new clock hands fabricated by Americlock weigh half that of the original clock hands. Furthermore, Americlock replaced the old clock clock motors with newer and larger clock motors with integrated LED light technology inside of them. This new system allows all the wiring to be run from the inside of the clock movement as opposed to another way of having the lighting supply on the outside of the wall. This protects the wiring from the elements and makes it easier to service in the future. These clocks also update for daylight savings time and power outages automatically. 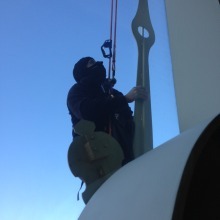 Americlock does our own climbing which ensures the job is done correctly by skilled and trained clockmaker instead of having to outsource the climbing to another company. This project was done in the cold of December but was completed irregardless of the cold weather and short daylight hours. 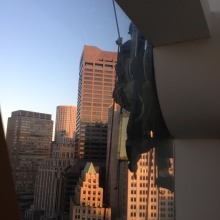 The view is always nice hanging out over Boston!